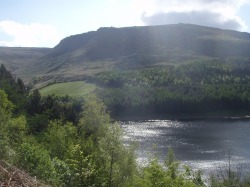 A group of us met up at Dovestones and went for a walk along the river. The weather was nice and after leaving the woods and slowly gaining height along the path we spent a lot of the walk following the river, travelling alongside it and crossing here and there to avoid impassable sections. After stopping for lunch some of the more intrepid ones explored the huge rocks strewn along the narrow valley. We eventually headed back retracing our steps for part of the way then travelling alongside the reservoir and cutting through some wood s to get back to the car park. 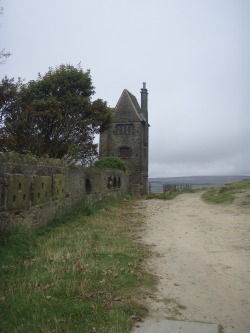 A small group met up at the barn in Rivington country park and followed the path up to the tower at Rivington Pike. The weather was overcast but we managed to avoid rain. We explored the multi arched bridge at the terraced gardens and had a look at the ruins of the old houses. Just before we left the woods we found the overgrown remains of the tiled floor of the hall that had once stood there. On the return journey we came down via the water gardens where we found (but didn't touch!) Fly Agaric mushrooms and climbed trees before heading back through the woods to the car park. This was the Troop's first camp in a long while. 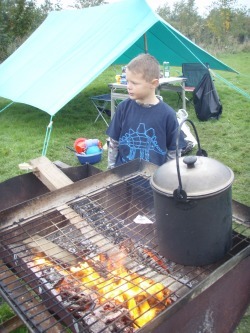 A group of four Scouts stayed overnight at Bibby's farm before taking part in the County organised "pioneering badge" course. A group next door were doing backwoods cooking and had plenty of food to spare so we tried foil cooked fish, pigeon and squirrell. There was no venison left for us to try! 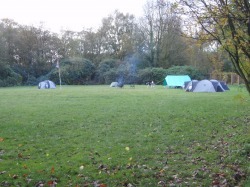 A group of six scouts travelled to Bispham Hall in Wigan. We arrived in the dark and just managed to get our tents up before the rain hit. The rain was even worse for the first part of Saturday and we spent alot of time huddled under the dining shelter. Later it cleared up so we managed to collect some wood and cook by open fire that evening. A few of the cubs spent a couple of hours with us before they moved up to Scouts a few weeks later. They learned the basics of using an axe and saw to cut up firewood. On Sunday we followed the orienteering course and had a go at building shelters in the woods. The camp will forever be remembered for the ghostly female figure that some people swore was standing in the window of the hall each night!